because the next set of accounts are all from the Hartlepool Jama’at. With a population of 98,000 and situated on the North East coast of England Hartlepool was originally two towns, the ancient town of Hartlepool founded in the 7th Century, known locally as the Headland, and the more recent West Hartlepool, founded in the 19th Century. They amalgamated in 1967 to form what is now the single entity known as Hartlepool. It is interesting to note that in the early part of the 7th Century, a Christian lady missionary, now known as Saint Hilda, was appointed Abbess of Hartlepool from where she preached and converted people to the Christian Faith. Some thirteen centuries later two ‘missionaries’ of the Ahmadiyya Muslim Community, having accepted the Promised Messiah may peace be upon him of the Latter Days came to live in Hartlepool in 1971. The two devotees of Islam were Dr. Hameed Ahmad Khan and his wife Mrs Sajida Mubashira Khan. In 1973, after working as a registrar in Hartlepool General Hospital, Dr. Hameed became a G.P. He was also later employed as a Police Surgeon and worked in that capacity for many years. By 1976 the couple had been blessed with three children and as the only Ahmadi Muslims in the area, they lived a life of loneliness and helplessness, as they thought they were living in a desert of religiousness. In Rabwah they had been raised by truly righteous people and lived in an excellent Islamic atmosphere, but living in Hartlepool they were keenly aware of the absence of similar opportunities for their children. In 1978 they moved to 5, Coniscliffe Road, Hartlepool, a house which Sajida ‘fell in love’ with before it was purchased. This address was a house, which Allah the Almighty was to greatly bless as many divinely blessed, and righteous people came to visit. That same year (1978) Sajida invited Hazrat Khalifat-ul-Masih III to Hartlepool and his Holiness accepted. A number of weeks later Mirza Tahir Ahmad who was later raised to the institution of Khilafat as Hazrat Khalifat-ul-Masih IV also visited their home. Sajida was well educated, having achieved a double Masters degree in English. She had great knowledge of the Bible and especially the Holy Qur’an and was very active not only in practicing but also in delivering the true message of Islam. In 1979 Sajida developed a strong passion to spread the teachings of Islam to the people of Hartlepool. In so doing she made many friends and contacts with English ladies in the Hartlepool area. As a result of the ‘coffee mornings’ she used to organise, Sajida was already in discussion with lady friends including Pamela Elder. These discussions progressed to large organised meetings where Ahmadi scholars were invited for the purpose of Tabligh. Notable among the scholars was a blessed Companion of the Promised Messiah (as), Hazrat Chaudhry Muhammad Zafarullah Khan (May God be pleased with him), who during his life had been Chief Justice at the International Courts of Justice in The Hague and also President of the United Nations 17th General Assembly. He visited in October 1981 and it was during his visit that Pam Elder accepted Bai’at and thus became the 1st English Ahmadi in Hartlepool. The year 1981 was also the year Sajida had her first encounter with cancer and Hazrat Khalifat-ul-Masih III advised her to proceed with surgery, She obeyed, and when the Khans, on a visit to Pakistan in December the same year met Huzoor in Rabwah, he very confidently told her to forget about the cancer and as a sign of Divine Grace, she later gave birth to a second son. After their return they decided to migrate from England and set up a medical practice in Pakistan, but in September 1982, Hazrat Khalifat-ul-Masih IV visited Hartlepool and in his discussions with Sajida he very positively advised her to build a Jama’at in Hartlepool. Sajida informed him that she could not build such a Jama’at as within a few months they were planning to migrate from Hartlepool to Pakistan. Huzoor admonished her and Dr Hameed and told them they should not return to Pakistan until they had established an Ahmadiyya community in Hartlepool. There was no doubt that this was a prophecy that a Jama’at would soon be created in Hartlepool. Huzoor promised to return, a promise that he fulfilled (17 times), because from that moment on, despite her continual encounter with cancer from 1981 -1994, Sajida, by the Grace of God, devoted her whole life as a most successful Daeen’ilAllah. Dr Hameed and Mrs Sajida Hameed both had a deep and lively interest in religion and this led to inter-religious dialogue with many friends and acquaintances. Over the years they learnt a lot about other religions, other than their own and as a result of their ever-increasing number of friendships, many local people also learnt about the true Islamic Teachings. They both epitomised all the true and beautiful teachings of Islam. Their speech, their actions and their way of life was so appealing, so attractive and so magnetic to all who observed them. Dr. Hameed, his wife and children practised what they preached and preached what they practised. It mattered not to them whether a person was religious or not, they treated everyone in the same manner. They were very hospitable and welcomed everyone to their home. They cared for the sick and helped the poor and needy. Young or old, male or female, people of any kind who needed a friend could always rely on them. Whilst Sajida was more gregarious in her social contacts, Dr Hameed was more of an introvert and would often seek refuge in the upstairs rooms of his house whilst Sajida entertained her lady friends. However, as her lady friends were very interested in Islam, some started to bring their husbands to the house and Dr. Hameed, encouraged by his wife’s success in making so many friends and integrating with the local community, decided to make extra effort to help his wife in her Tabligh activity. Sajida Sahiba again met with success in 1985 when two more English ladies (Mrs Beryl Taylor & Mrs Ronnie Rowsell) from Hartlepool accepted Ahmadiyyat, followed by one other lady (Mrs. Patricia Duxfield) in 1986. Dr. Hameed’s first male convert was Mr Alex Duxfield in 1986 and another (Mr Stuart Lawson) in January 1987. Hazrat Khalifat-ul-Masih IV visited Hartlepool in April 1987 and Sajida was able to convert another two ladies (Miss Christine Harrison and Mrs Alison Lyon) during this time and another (Mrs Marion Hedges) in May the same year. Dr. Hameed was also fortunate to convert two men (Mr. Alex Lyon and Mr. Paul Hedges) during Huzoor’s visit followed by another two (Mr. Maurice Threlkeld and Mr. Edward King) during the same year. During the first six months of 1988 both Dr Hameed and Sajida were each blessed with more converts (Mr William Bilal Atkinson and Miss Joanne Raine). 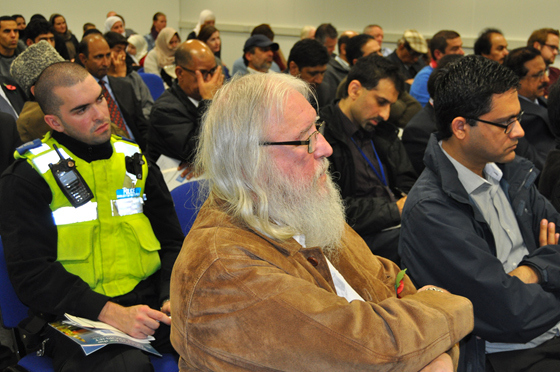 During 26th – 27th November the same year, Hartlepool Jama’at held the first ever Regional Forum for New Ahmadis. Maulana Ataul Mujeeb Rashid (Missionary in charge UK) attended along with other members from the centre and especially the new Ahmadis from the region as well as two other successful Daeen’ilAllah, Dr Saeed Ahmad Khan and his English wife, an English lady convert from the 60’s, Mrs Salma Mubarika Khan. It was a wonderful, ‘spiritually charged’ and blessed weekend. Another notable incident, which occurred during this weekend, was that two other Bai’ats occurred whereby a father (William Hedges) accepted Ahmadiyyat after hearing his daughter (Mrs Vivienne Noble) had recently accepted. Mr Hedges’ wife and son had accepted Ahmadiyyat the previous year, thus a whole family had joined the family of Ahmadiyyat in Hartlepool. Sajida was again fortunate to convert another two ladies (Mrs Rose Hedges-1989 and Mrs Lillian Thompson – 1990) related to that family. Once the Jama’at was established it was centred around the Khan’s home and all meetings, Khutbas and congregational prayers were held there. As the number of converts and interested parties grew, so did the feeling of belonging to a family unit. It is far easier to make that person more relaxed in a homely atmosphere where only yourself or one or two other people are present. Other pious and Godly Ahmadis were invited on different occasions to visit the Jama’at and meet the new converts and Dr. Hameed and his wife regularly conveyed those under Tabligh to the London Mosque for Mulakaat with Huzoor. By this time many of the converts came to know each other very well and they in turn invited other people, friends and relations, to the Jama’at. Even non-converts were invited to perform Salat and some quite happily did so. The Jama’at was gradually growing in number so much so that Dr. Hameed had to convert his double garage into a meeting room to house the ever growing number of meetings of Jama’at members and interested guests. At all Jama’at meetings most of the ladies brought food to share amongst all members. All members continued to receive personal as well as collective attention from both mentors and a very amiable ‘family atmosphere’ was created. Islamic moral and religious training was always taught and emphasised in all meetings by Dr. and Mrs Hameed and they were the best exemplars and were ever willing to accept all the good traits they found in their English friends’ way of life. In January 1989 Huzoor visited Hartlepool to read the Nikah and attend the wedding of Dr. Hameed and Sajida’s daughter Amtus Shakoor Tayyaba to Mr Syed Hashim Akbar Ahmad. This occasion was attended by many Ahmadi and non Muslim English guests. Afterwards, Huzoor was delighted to hold a question and answer session with all the guests. Jumma prayer in Hartlepool was always very well attended and on 3rd March, 1989, the first Khutba by a local English convert was delivered. Sajida was blessed with another Bai’at (Mrs Laura Hassan) in 1990. The year 1991 proved to be a successful year for Sajida. Before the arrival of Huzoor to a Regional Forum for new Ahmadis in October she was able to achieve another three Bai’at (Mrs Gloria Gavilette, Miss Sara Gavilette and Mrs Patricia Cram). The Forum for new Ahmadis was held on Sunday 13th October. Although the Jama’at had hosted such forums before, this particular one was very special in the fact that Hazrat Khalifat-ul-Masih IV graced it by his presence. It commenced at 10am and comprised a full agenda of short speeches by the new Ahmadis. Mrs Maha Dabbous also visited and gave a speech ‘How I became and Ahmadi’. At 4.15pm the final session started with Tilawat and a Nazm by local English Ahmadis followed by a spiritually stimulating Question and Answer session by Huzoor. On the last day of 1991, Sajida converted another lady (Mrs Susan Dodd) and in March 1992, Dr. Hameed converted Mr Richard Longworth (from Merseyside) to Ahmadiyyat. During this year, the first English Ahmadi missionary, Mr Bashir Ahmad Orchard paid a visit to Hartlepool to Jama’at and led the Jumma prayer. Mr Tahir Selby, the second English Ahmadi missionary was also a frequent visitor. In 1989 he was appointed Regional Missionary for the area, which included Hartlepool Jama’at. In April 1993, Dr Hameed converted Mr Ali Akhtar to Ahmadiyyat and Sajida, who, by this time was battling with the effects of cancer, converted Mrs Christine Atkinson, who was, unknown to Sajida, to be her final achievement in calling English ladies to Ahmadiyyat. In January 1994 Sajida’s father, Brigadier Muhammad WaqiuZamman Khan (retired) came to Hartlepool. Dr Hameed requested him to address the Jama’at on how he had the honour and distinction planning the migration of Hazrat Khalifat-ul-Masih IV from Pakistan to London. It was later ‘good humouredly’ pointed out to her father that he may have been a Brigadier, but his daughter outranked him by holding the rank of ‘General’ in the field of Tabligh. His face ‘lit up’ and he very graciously acknowledged this accolade attributed to his daughter. In July of that year the engagement of her daughter Munavara to Dr. Saboor Ghauri was announced. As the months progressed Sajida’s illness became more acute. Sajida’s health continued to deteriorate and on 3rd December 1994 she passed away, having obeyed and fulfilled the instructions of the Khalifa of the day by creating a Jama’at in Hartlepool from the indigenous population. Although Sajida had passed away, Dr Hameed, though heartbroken, never for a moment lost sight of the fact that he had to continue the work of mentor to the many English converts that formed the Hartlepool Jama’at and it did not detract him from his passion for Tabligh. In July 1995 Huzoor visited Hartlepool to attend the wedding of two children of Dr Hameed and Sajida, i.e. their eldest son Fareed and their daughter Munavara. The same day Huzoor also graciously officiated at the Ameen ceremonies of two of Sajida’s converts, Mrs Ronnie Rowsell and Mrs Christine Atkinson. Huzoor made another two separate visits to Hartlepool that year. 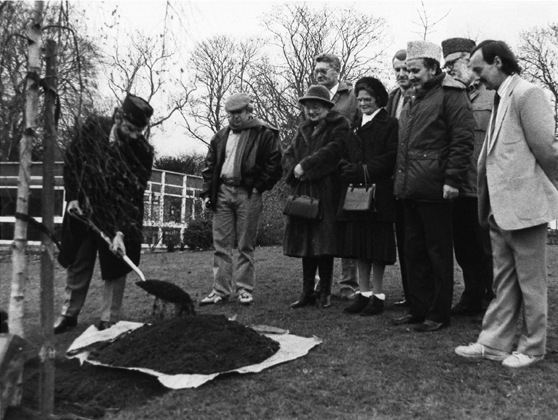 In February 1996 two men (Mr Edward Wrigley and Mr Timothy Fleming – father and son in law) accepted Ahmadiyyat as a result of Dr. Hameed’s preaching. They were the last men Dr Hameed was able to convert to Islam. Dr Hameed was also successful in that Mrs Marjorie Sykes also accepted Ahmadiyyat in October the same year. Perhaps the ‘crowning glory’ of this miracle that occurred in Hartlepool was a visit in August 1997 of Hazrat Khalifatul Masih IV. He was accompanied by Hazrat Mirza Masroor Ahmad who was then Nazir Taleem Anjuman Ahmadiyya before his elevation to Khilafat. Other notable guests were the son of Hazrat Mirza Sharif Ahmad – Sahibzada Mirza Mansoor Ahmad (Nazir-Aala and father of Hazrat Khalifatul Khamis, Hazrat Mirza Masroor Ahmad). Another notable and distinguished guest was the son of Hazrat Mirza Bashir Ahmad – Sahibzada Mirza Muzaffar Ahmad (Amir USA). Hartlepool Jama’at was therefore blessed that weekend with the presence of three grandchildren of the Promised Messiah (as), one from each of his sons i.e. Hazrat Mirza Bashiruddin Mahmoud Ahmad, Hazrat Mirza Bashir Ahmad and Hazrat Mirza Sharif Ahmad. In mid 1998, Dr. Hameed decided the time was right to fulfil the needs of the members of Hartlepool Jama’at, especially the needs of those in the future who would definitely require the necessity of a permanent base. With this in mind he made enquiries with Hartlepool Borough Council regarding the availability of suitable land on which to erect a Mosque. From this time until August 1999 the council had identified 19 pieces of land. After consultation with some members of the Jama’at it was agreed that the only suitable council owned site was that at the junction of Turnbull Street and Brougham Terrace, Hartlepool. On 21st February, Dr. Hameed, who at this time was gravely ill with cancer, received a message from the local council that they were willing to sell the land at a price of £60,000. As a result of his terminal illness Dr. Hameed passed away eight days later. However, because of Dr Hameed and Sajida’s great Tabligh success the blessings on Hartlepool Jama’at continued and the site was later purchased for £35,000 and a most beautiful purpose built Mosque was erected on the site after the foundation stone was laid in 2004 and the inauguration of the Nasir Mosque by Hazrat Khalifat-Ul-Masih V on 11th November 2005. The ‘miracle’ that occurred and radiated in Hartlepool was only by the sheer Grace and Mercy of Allah the Almighty. The success and progress of the Jama’at can be attributed to the admirable example and devoted work of Dr. Hameed and his wife Sajida. In their everyday lives they inculcated the Ahmadiyya motto ‘Love for all Hatred for None.’ They were very scrupulous in practising what most religions advocate, that is, Love of God, and to live in peace and harmony with their neighbours and fellow men. Not only that, their Ahmadi friends had similar lifestyles and shunned any form of hatred, enmity or bitterness and only led a life of prayer, truth, peace and charitable deeds. There were many people, men and women, who came to know the Khans and were very impressed with their Islamic way of life. As Ahmadi Muslims the Khans were so very honest, truthful and virtuous, so full of humbleness and kindness. Almost every person who entered their home later commented that they had been overcome by feelings of tranquillity and peace. It was the form of lifestyle that attracted many local people men and women and as a consequence, by the Grace of God, Sajida was responsible for converting eighteen English ladies to Ahmadiyyat during her life in Hartlepool. She also played a major role in assisting her husband, Dr. Hameed, who, during his time in Hartlepool was able to convert twelve Englishmen and one English lady into the fold of Ahmadiyyat. The legacy Dr. Hameed and his wife Sajida left the town and people of Hartlepool was a Jama’at of people who had accepted the Messiah and Imam of the age and a House of God from which the beautiful teachings of Islam could be transmitted far and wide. Thank God they were completely obedient to the Khalifa of the day and did not migrate to Pakistan. All praise belongs to Allah, the Lord of All the Worlds.